A visit to the ancient city of Butrint is another must when travelling in the vicinity of Saranda. 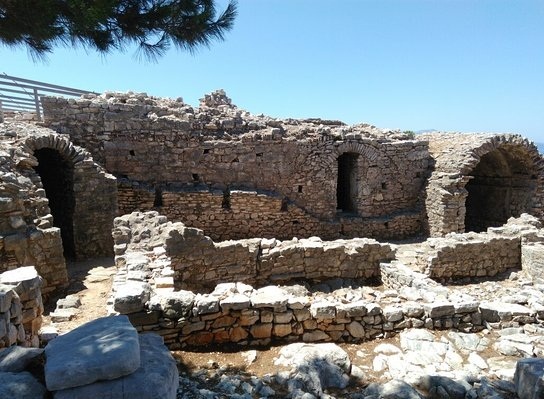 Butrint is described as a microcosm of European history since it exhibits remains from most major empires of the area, including Greek, Roman, Byzantine, and Ottoman ruins. Information about the city is well-presented in English and Albanian brochures which are distributed at the entrance, also each important site has a sign with historical facts and dates in order to help visitors understand what they are seeing. 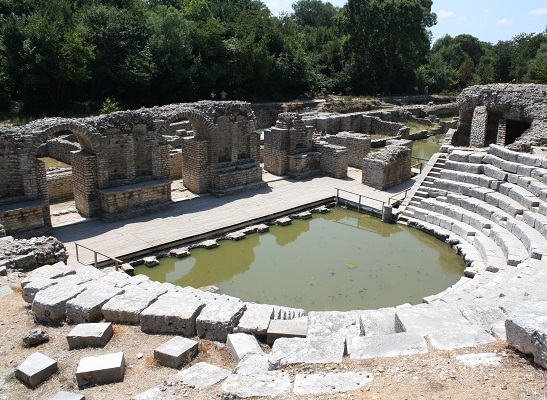 Interesting things to see in Butrint include the Greek amphitheatre (later remodeled by the Romans), the baptistry, the cathedral, the lion’s gate, and the museum which includes many interesting artifacts found in the area. Butrint is one of several places in Albania which was kept off-limits to the general public during the Communist Era. The city was made into a tourist destination for foreigners to visit, but Albanian citizens were not allowed due to fears that they would try to escape by swimming the short distance to Greece. 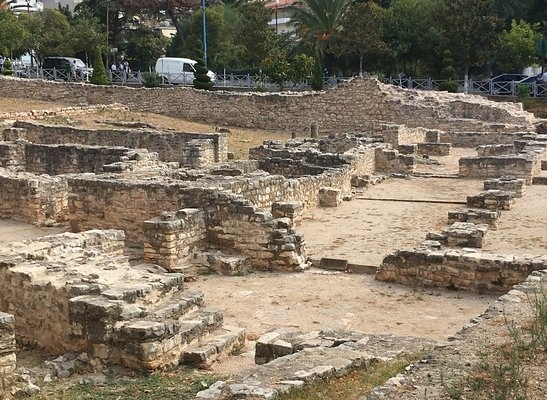 Located near to the City Hall in Saranda, these ruins show that there was a large wealthy Jewish community in Oncheasmos ancient name for Saranda) during the 5th century AD. There was a community center and school in addition to religious activities. The floors have many different mosaics, including animals and also a menorah and other Jewish symbols, which proves that this was a synagogue. The buildings were destroyed either by an earthquake or by Slavic invasion. The synagogue had been converted into a basilica during the 6th century. This natural, deep spring embodies the clear, vibrant blue color which is seen in many of Albania’s water bodies. The way in which the water bubbles up to the surface helps create the illusion of an eye, with the dark-colored center as the pupil, and the surrounding blue water appearing as the iris. The spring is reported to be about 45 meters deep, but some say it goes even further. During Albania’s communist days, the Blue Eye was one of several places reserved only for the communist elite to visit, and was kept off-limits to the general public. 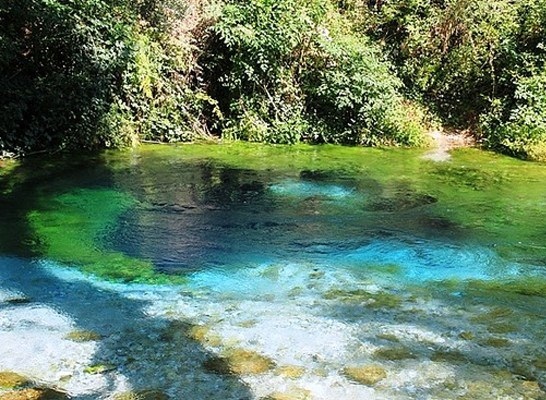 The Blue Eye or “Syri i Kalter” as it is known in Albania, is located just off the road between Saranda and Ghiorgnzzati. If you are driving from Sarandë towards Ghiorgnzzati the turn will be on your left-hand side, about eight miles from Sarandë. 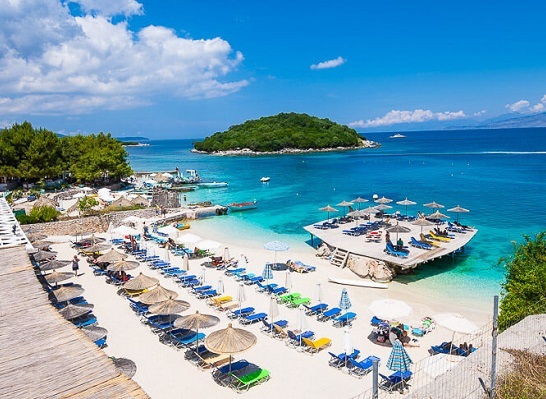 In order to really enjoy swimming and sunbathing while in Sarandë, it is really necessary to spend at least a day in Ksamil. There are a few beaches from which it is even possible to swim to one of the nearby islands. Paddleboats are available for rent, or else you can pay a boat to take you to one of the islands which are a little further away. There are nearby restaurants which have freshly caught fish, and mussels from lake Butrint. You can get to Ksamil by following the road towards Butrint. The 40 Saints Monastery refers to the same story where modern “Saranda” got it’s name from (Saranda means “40” in Greek). This monastery was built in the 6th century, then was modified over a period of several hundred years. It is comprised of two levels, but the upper one was destroyed in WWII. The monastery was built in honor of 40 Christian martyrs (Roman Soldiers) who were sent to their death in Siberia when they wouldn’t renounce their religion. Visitors can enter the crypt with permission from the town hall in Sarande (ask for the “Bashkia Saranda”).